A wooden door, set half way up a wall with two holes at eye level. Looking through the peep holes you see a naked woman, lying spread eagle with a book in her hand. The landscape stretching out behind her to a waterfall. ‘Life cycle.’ Henri-Robert-Marcel Duchamp. He put a urinal on display once, called it Fountain. 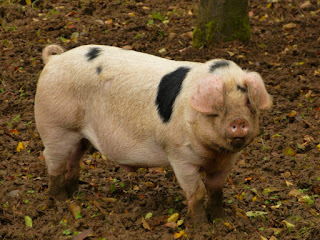 Mark and Helen are the proud owners of 2 Gloucestershire Old Spots pigs, Gertrude Cook and Archibald Smythe Cook. Open day Sunday the 25th, come and see our pigs. William has built a pigsty befitting these two noble animals. From the front door you have a paved path, highlighted with solar lights, leading you eye to those noble pigs. Lady Gertrude and Sir Archibald Smythe seemingly oblivious to the mounting interest, Lady Helen attributes it to the special grass left by the Jamaican builders, while going about their daily tasks. Lord Mark explained, 'It is just good grass man.' All I can say is, he is so cool. Moving on, Gary needs a new car to replace his ageing vehicle. To be fair, he has had it some time. His family has grown, 3 children, the first is now a teenager going on 20. Then there is Dan and Alex who is a 2 years old, or is it 3, I lose track. Most importantly, there is the most beautiful woman in all Italy, Claudia. Gary loves her to bits and she has asked him to get a new car. No that is putting it too mildly, she demands it, clever girl, as asking gets you no where, where as demanding is a statement of fact. The unsaid threat of concrete shoes attached to his wetsuit, does weigh heavily on his mind. With all that in my thoughts, I have decided to start a fundraising bid to buy them a car they deserve. I have put £ 50 in the fund and I am asking, with all humility, give generously, show you care and we might, just save them from a Renault or Peugeot. Give generously and help this lovely family from the busses and trains, Renaults and Peugeots. Had breakfast in Wimborne this morning with Susan and her friend Vivienne. Lovely lady, and a fountain of knowledgeable about Wimborne. More about Dame Vivienne later. Very good...must meet those Pigs soon! Lord Mark is panicking now trying to find these pigs! Very interesting reading Glen, thankyou!